As Single Ply Roof Information Continues to grow in popularity we wanted to provide some information to help explain the 3 Types of Single Ply Roofing, TPO, PVC, and EPDM, each with different properties that may make one particular Single Ply the best fit for a Retro Fit Assembly, or for new construction. I remember when I first was starting out in the ‘commercial roofing industry’, one of the first things I did was research analytically, ‘where is The Growth’, at that time going back to 1995 TPO had shown consistent growth, and is projected to continue at projections of 3.1% to 4% growth (depending on both the study and the region) through 2018. Entering the commercial roofing companies Houston industry years ago, one of the first thing I did was learn everything I could about TPO, as well as help make adjustments in my employers business to accommodate the growth fueled by Single Ply Roofing. This investment of time and effort not only helped grow my employers business but has led let to consistent growth, year after year, and proved to have a great ROI for time and effort invested. As I was learning about TPO I was also learning about the other single plies, EPDM and PVC. While TPO remains my favored single ply. Having the outlook that every building is unique, and should have all factors taken into account prior to specifying any roof system. There is no doubt that when repetitive elongation properties are of great significance that no other single ply can compete with EPDM. Just as when animal fats from greases from restaurants, or chemical residue are in abundance that PVC single ply will most likely be the best fit of all 3 single ply roofing systems. In sum, while TPO claims the lion’s share of the single ply market in the USA, it is up to the architect, the roofing consultant, or when applicable the roofer to make a decision, not based on what is their favorite, but what is likely to see the longest life cycle and perform the best, as well as for the roof to fit business model of the building that it covers. I still favor TPO single ply roofing; however having the viewpoint, “every building is unique, and there is not a one size fits all roof”, is a philosophy that benefits both the roofing contractor and the building owner. With the professional who consistently specifies the best roof for the building and understands, “Anchor Roofing”, is the difference from the average to the truly great. I urge anyone looking into roof repair Houston, be it new construction or retro fit, to look at every building as unique, practice your trade with discipline, and do your research (and never stop researching as understanding is empowerment), as there has never been a one size fits all roofing system, in the history of the US market. 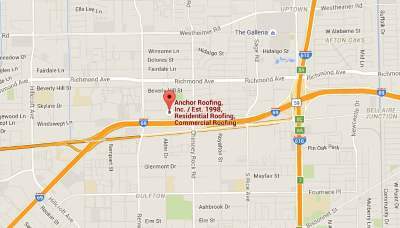 Anchor Roofing specializes in commercial roofing in Houston, Texas. We pride ourselves on a long history of successful installations of all 3 types of single ply. We will gladly evaluate your buildings roofing needs and gladly provide multiple options based on what is the best fit, keeping your goals and business plan in mind with the understanding, “all buildings are unique”, and being able to account your business model, how long the life cycle term your roof needs to be, and the ability to explain multiple systems gauged as ideal, and providing the associated cost / benefit, be it a single roof system, a roof coating to extend the service life or decrease utility consumption, to steep slope metal and tile, as well as asphalt systems. “There is not a one size fits all roof out there”.